A Google search for a39adfe.msi turns up nothing. Does anyone know if this is something expected and if not, why would it happen? This is expected behaviour. 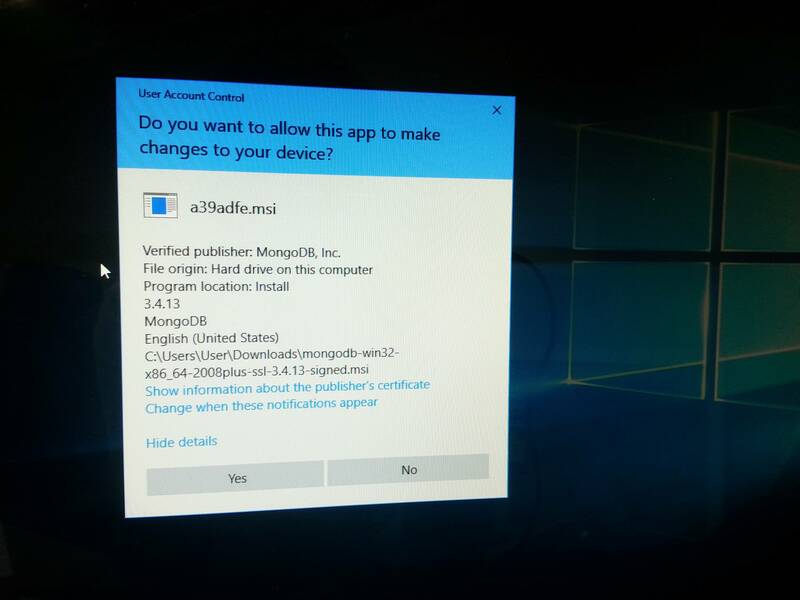 When you install an MSI package, Windows caches a copy of the installer in "%windir%\installer" (a hidden system folder) and renames it using a random hex name. You can delve into the Windows registry to divine the mapping between original installer and the cached version, but if you'd like extra assurance it is probably easier (and more definitive) to compare the two .msi files. Aside from the filename, the cached .msi file should be the same as the original .msi: you could compare details like file size, signing information, and checksums. In your screenshot, the verified publisher is "MongoDB, Inc". For some related information, see: Where the MSI file is copied after the installation?. Not the answer you're looking for? Browse other questions tagged mongodb windows-permissions uac install or ask your own question. If windows already has all admin rights, wouldn't a malicious program just need to pretend to be windows? Does write permission over a windows service always imply privilege escalation? Is UAC enabled and set to Elevate without prompt actually a security protection? What can someone do with (non-admin) command prompt on a network?